As it turns out, having the healthy, balanced meals as recommended by the Health Promotion Board is not as simple as it seems. For me, it's simply because affordable food options near the office are super limited. What salad and chicken breast? The only "clean eating" I get to do only involves wiping out plates of greasy, MSG-filled economy rice. I imagine many other Singaporeans have this problem too, which is why meal subscription services are such a hit. They cater to the needs of those who neither want to spend a bomb at fancy restaurants nor trudge downstairs and join the interminable hawker centre queues in 34-degree Celsius weather. Unlike one-off lunch deliveries, meal subscriptions typically come in weekly and monthly packages, whereby you pay a flat fee for a fixed number of daily meals. This means it's great for budgeting too, because you'll always know exactly how much you're spending on lunch. WHAT ABOUT MEAL PREP? CAN'T I JUST BRING MY OWN LUNCH TO WORK? You can, but that's assuming you have the time to go grocery shopping for ingredients and cook your meals in advance. Meal prep is exactly as its name suggests - preparing your meals ahead of time. For most, it means setting aside a day (usually a weekend) to plan and prepare all the dishes and required ingredients for the upcoming week's meals. The good thing about this practice is that it can help you to maintain a balanced diet as you can plan your daily macronutrient intakes. For instance, you can properly balance the amount of protein, carbohydrates, and fibre for your selected meal(s). You don't have to be a gym rat to meal prep; you could just be planning to eat more carbohydrates for that energy boost before yoga. These are suitable for the calorie counters. Most offer healthy options like low-calorie and high-protein meals. As such, they're generally quite pricey at $10+ per meal. Price: Prices are calculated per meal, and there's no minimum number of meals for subscription. You can order just 1 lunch to try today, or the whole week's worth of breakfast, lunch, and dinner. $9.90 is the cheapest ingredient combination I could find this week, and $23.90 is the most expensive - the largest portions of meat alone can cost up to almost $20. Another one for the health junkies, Fitness Ration offers quite a few meal options: There's the nutritious Rise Breakfast series, high-protein Active Meal Series, and low-carb high-fat Cutting Edge Keto Series. The menu is fixed, with several options per week. 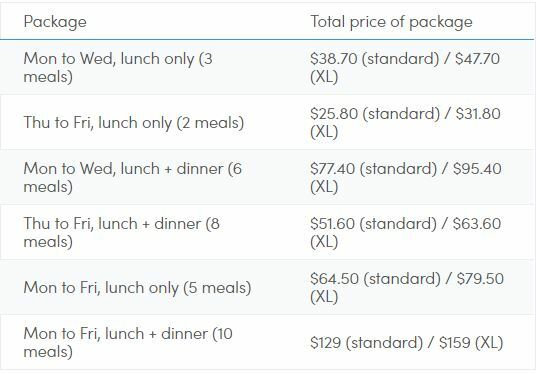 Although prices are affordable, the cheapest package is the 5-meal bundle. You can't buy single meals to just try it. Price: The only under-$10 meal option is breakfast (from $7.50/meal). 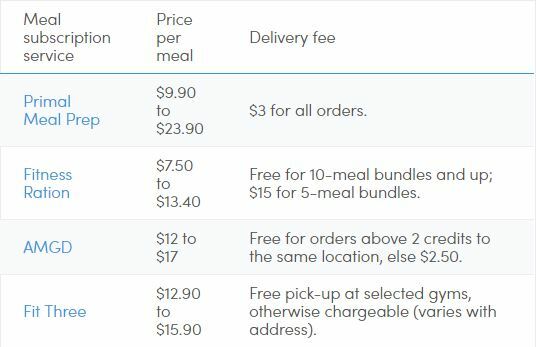 The standard meals - Active or Keto - are $10.90 per meal, unless you get the 15-meal bundle (then it's $10.40). That's only $0.50 savings per meal, which (in my opinion) isn't a very big incentive for first-timers to get the most expensive bundle. Fit Three's carefully curated menu is designed by a certified dietician, and each meal is typically 500g with 150g to 200g of quality protein (meat or fish). There are three main food options: Omnitarian (i.e. "regular" option), Low-Carb (like Omnitarian, but with more fruits, nuts and vegetables), and Vegetarian (purely plant-based proteins with fruits, vegetables, legumes and grains). Breakfast options are available too - this week it's all pancakes paired with yogurt and honey. Price: No matter what subscription schedule you choose, meal prices are the same. It's $12.90 for the standard serving, $15.90 for XL, and $5.90 for breakfast. If you're a first-timer looking for the cheapest package to try Fit Three, you can order a half-week delivery (early and late week) for +$5.90. For the full week, it's +$9.90 (2 deliveries). Not all addresses are eligible for delivery though - check your address here. If you can pick up your food at one of the selected gyms, it's free. AMGD was founded by 3 friends who wanted to provide healthy food that's tasty and convenient. AMGD stands for AHHMAHGAWD, and is how good they want you to feel after eating their meals. The menu is fixed - no ingredient customisation - but the good news is that they offer over 20 meal options at any time. So you have plenty to choose from. Not so good for those who need very specific meals, but great if you just want a variety of generally healthy meals. Price: AMGD is the most expensive of the lot, with a 1-meal price of $17. 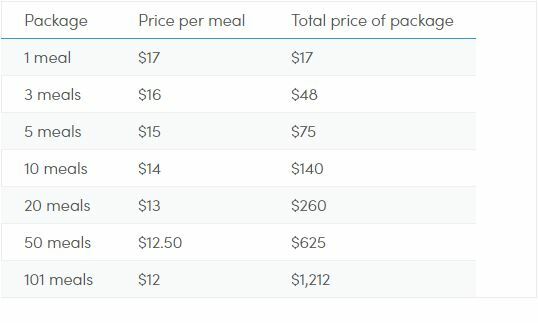 If you want to order it at the more competitive price of $12 per meal, you need to get the 101-meal bundle, which is a whopping $1,212 - not so wallet-friendly for first-timers. Delivery is free though. 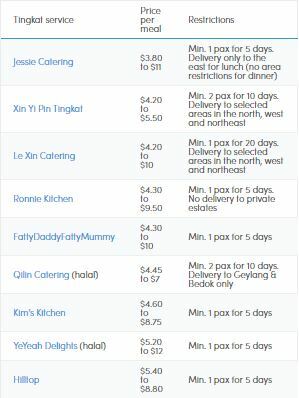 Tingkat food subscriptions are typically provided by catering companies, and you can compare them via the Foodline.sg portal. Food selection-wise, they're all pretty similar in that they're cai png-style meals - basically rice and a few dishes. However, unlike at hawker stalls, you can find less-oil and no-MSG options here. Here's a rundown on the caterers and their prices.